I really like the photo of the CNG truck being fueled – you can see the Agility Fuel Systems Fuel Management Module (FMM) in the picture. . .
Click here to see what I mean. . . I painted and installed the slightly modified battery box from FFMetal this past weekend. Just to be different, I decided to paint the box white on the inside and black on the outside. 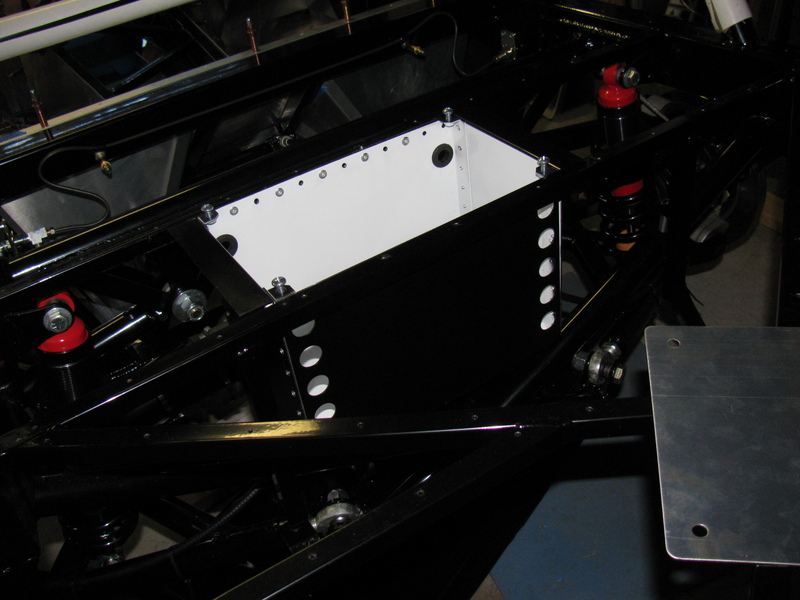 As you recall from my previous Coupe update, the battery box fits very tightly into the chassis – and I figured out a way to install the battery box without scratching up the paint – the trick is to install and build the box piece-by-piece into the chassis space. 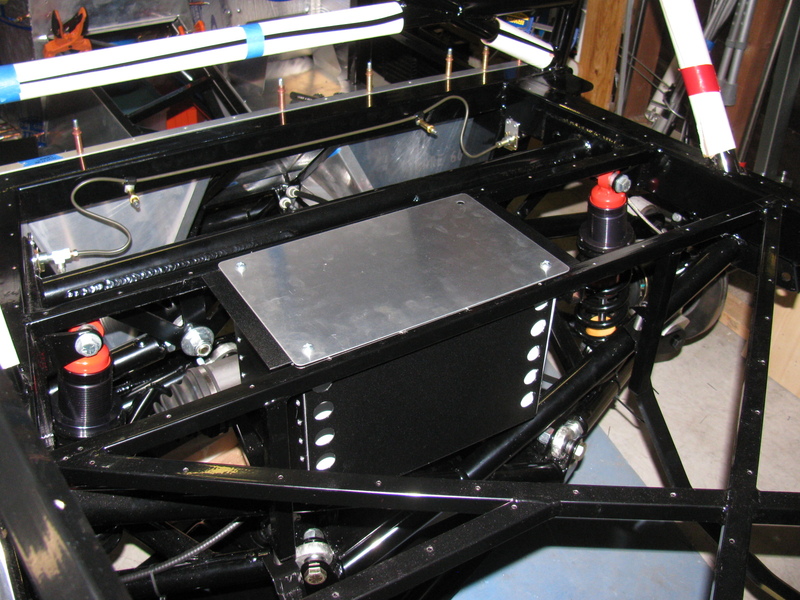 In other words, do not assemble the battery box and then mount it into the chassis – instead, build the box into the chassis. NOTE: By building the battery box into the chassis, adjusting one side of the box inward (as described in my previous battery box notes) may not be necessary. Try a dry-fit before you drill the side of the box to change the dimension slightly. A close-up of the small cut needed on the left side of the battery box. 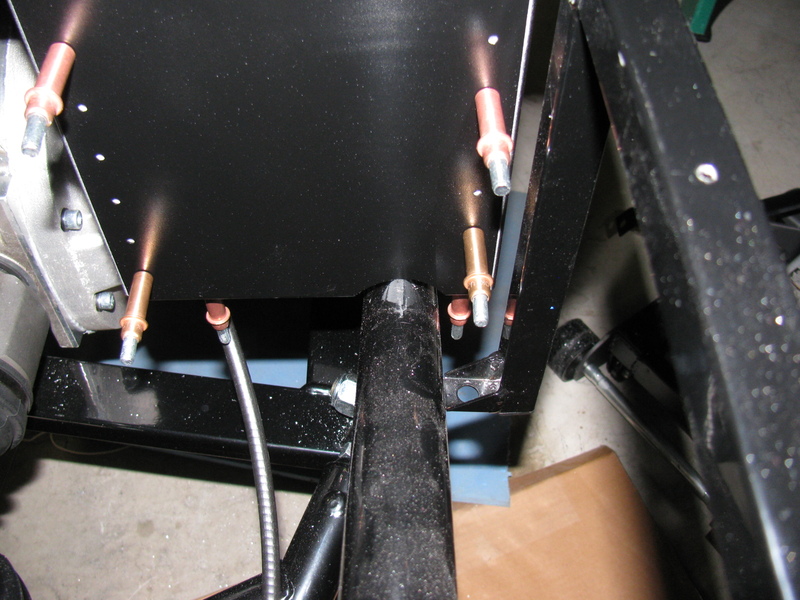 This cut-out does not interfere with the battery – but the battery clamp bar may have to be moved, depending on where terminals, vents or filler caps are on the battery. Another view of the two-tone battery box. I like the white interior, it makes it look nice and clean. Of course, a lid will cover everything later. . . The battery box with the supplied cover in place. Since I moved one side inwards, one cover screw does not line up properly. This does not bother me too much – I will install a small piano hinge at the upper side of the battery box, and the bottom two screws will hold the cover in place. When the trunk floor panels are installed, I will make a cut-out to access the battery compartment. The instruction sheet shows how to make the cut-out in the floor panel, but I will make the cut-out with an easier technique that woodworkers use: A router and pattern bit. I will show how this is done when I get to that stage. I may make a small finger-hole on the cover so it will be easier to open. Insulation and carpet will cover the entire trunk area later. 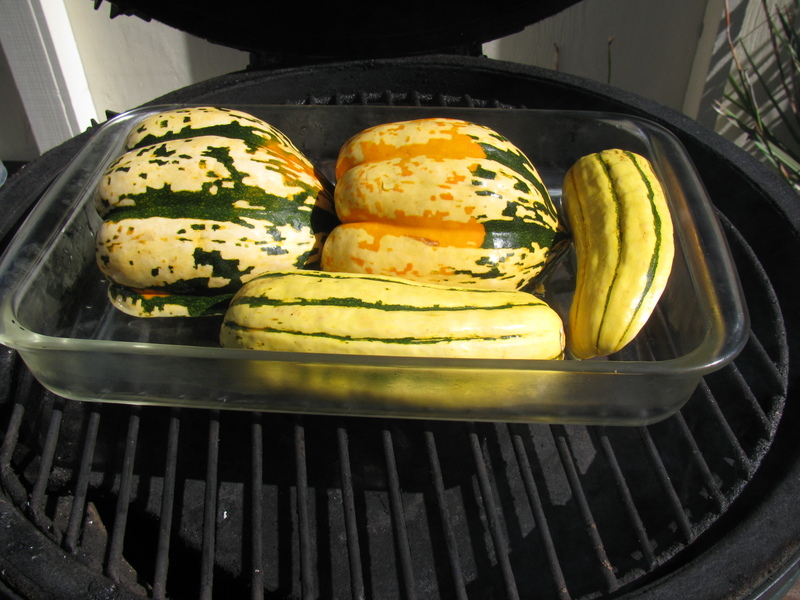 For the last several weeks I have seen a pile of colorful winter squash at the local grocery store, and wanted to roast some in my Big Green Egg. So I finally tried this, using a recipe from food.com. It is simple to make and very tasty when smoke-roasted on the BGE. Here are some pictures of how I did my Sunday dinner. . . 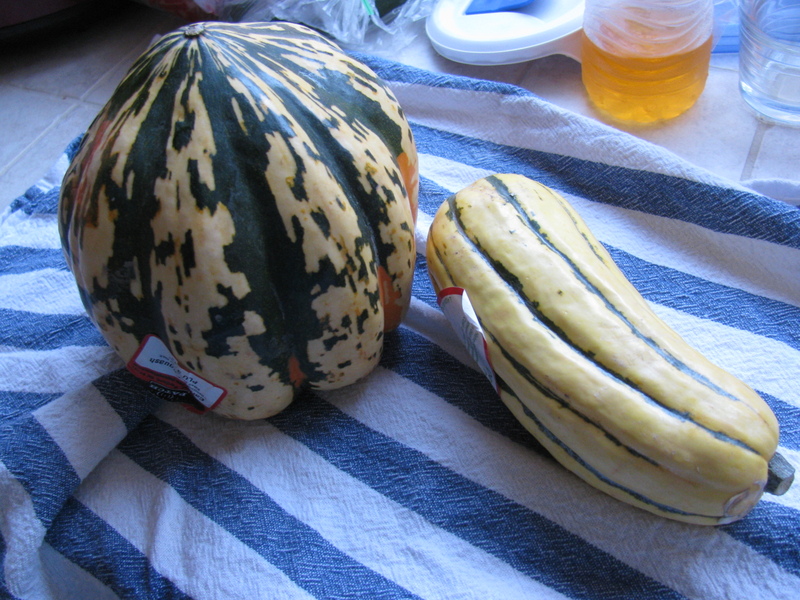 Squash cut length-wise, seeds removed and placed in a Pyrex baking dish with some boiling water. 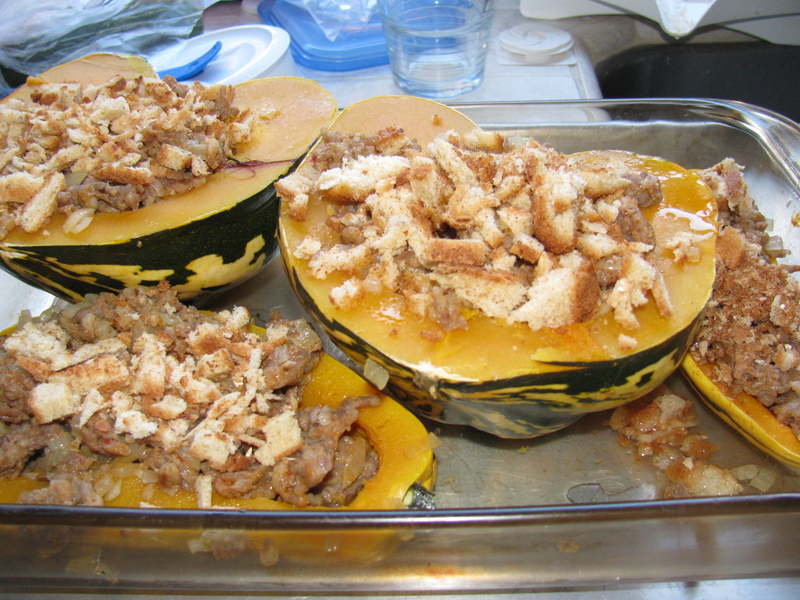 Bake/roast for about 35 minutes at 350 to 375 degrees F.
Remove the squash and stuff with (cooked) sausage, onion and bread crumb mixture. . .
Back on the grill and continue baking for another 20 minutes – or until done. 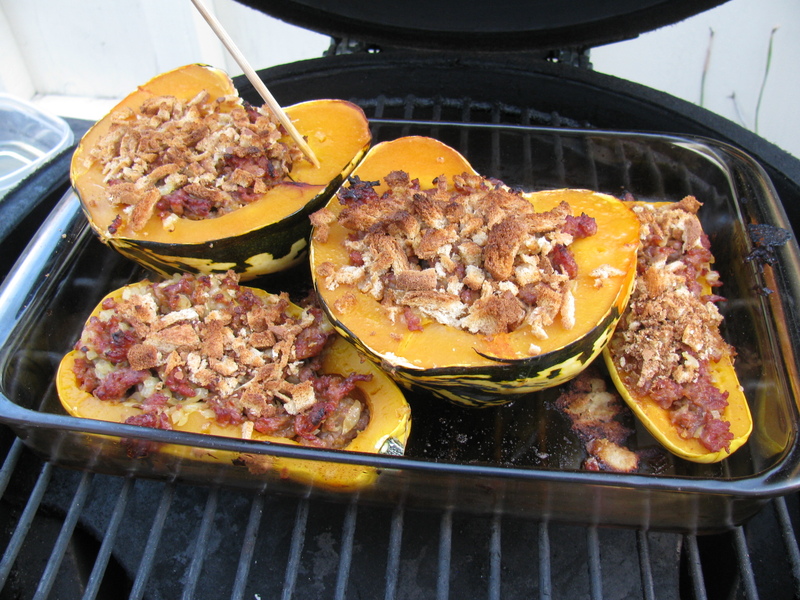 Poke the squash with a skewer or fork to verify doneness. 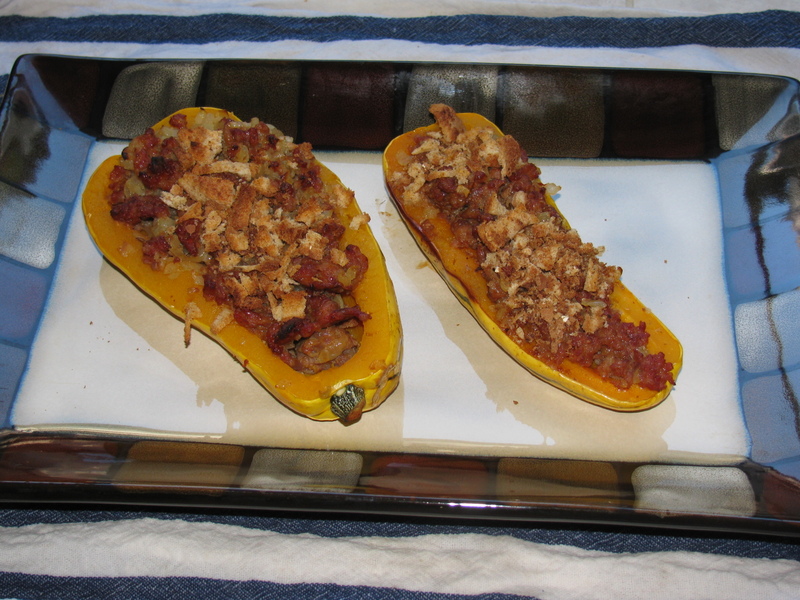 Stuffed squash 1 – done. The smoke flavor, the tender squash and the pork sausage go very well together – Give this simple recipe a try, it’s mighty tasty! Skiing season is almost here. The rain earlier this week (Oct 9 and 10) generated some snow. Woolly the mammoth statue near the Main Lodge has a dusting of the white stuff, and it already looks good.Mammoth announced their Opening Day: November 7! I bought one of the FFMetal battery boxes from Linwood. It really is a nice item, and it is indeed made with precision. However, it is designed for the Factory Five Racing Roadster. And although the Roadster and the Coupe share the same chassis design, they are not identical. So I did not expect the box to just plug into the trunk area like the Roadster. But I know several builders who have installed the FFMetal battery box successfully into a Type 65 Coupe. Looking at the Factory Five Racing forums, I found my answer – thanks to “Fluge” and “CJBergquist” for their posts, pictures and advice! FFMetal battery box for the Roadster, trying to fit into the Type 65 Coupe chassis. Very tight by just a smidgen. 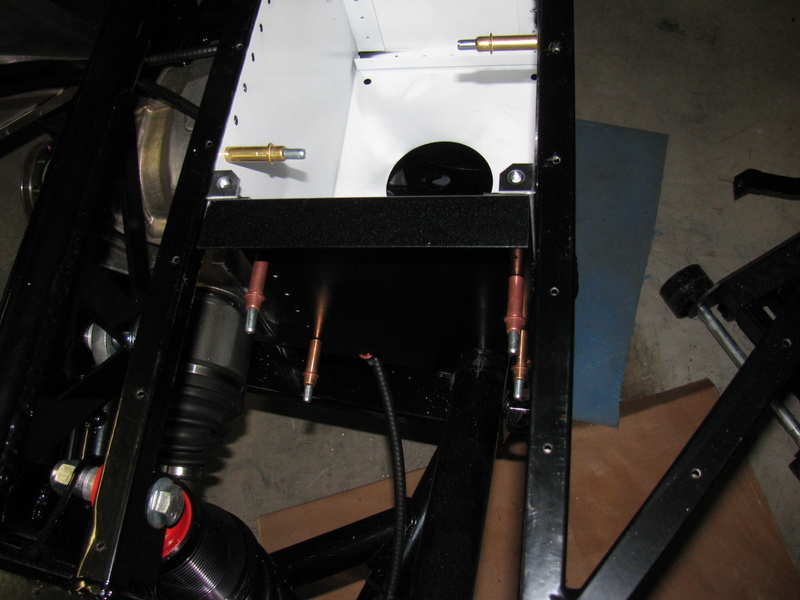 Battery box for the Roadster fitment into the Type 65 Coupe – just a little off. The secret! Remove the side panels and slip it in from the middle of the span or from underneath the chassis. View of the passenger side of the box. Now the box can be pushed into place. Here’s a look at the cut-out from the inside of the box. There is one place that needs some trimming – the X-brace on the driver’s side. Another view of the battery box with sides removed. View of the battery box from the rear. 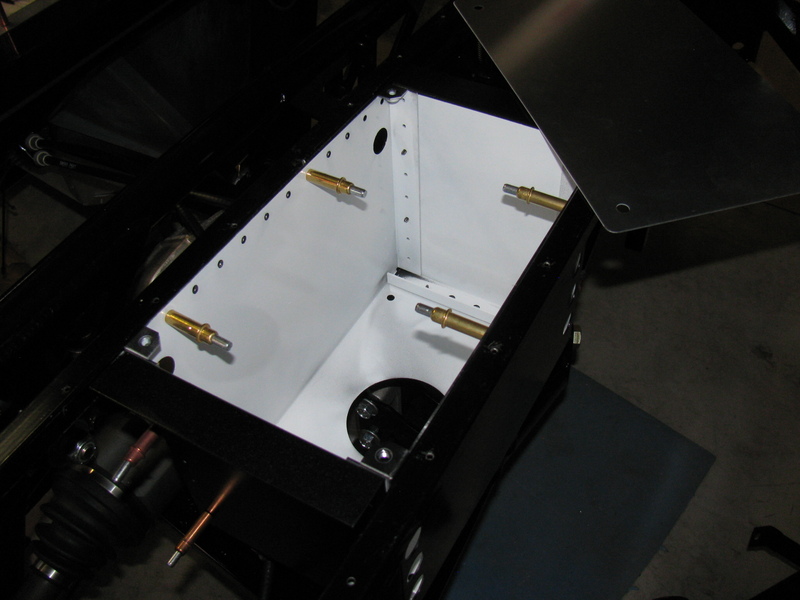 FFMetal battery box cleco-ed into place. Re-drilling rivet holes. Only the driver side needed new holes. Using a “mending plate” for a pattern, new rivet holes were drilled in-between the original holes. I will be painting the inside and outside of the battery box at the next work session. Stay tuned for more updates…. Great announcement from Paper Transport in Green Bay, WI, USA. Nice mention of the Agility Fuel Systems and how their natural gas fleet is both cost-effective and clean. Click here to see the story…. Early last week, a co-worker bought a falafel plate for lunch. That made me want some all week long. Since do not like to fry foods in my kitchen (too messy) I wanted to try making some on my Big Green Egg. 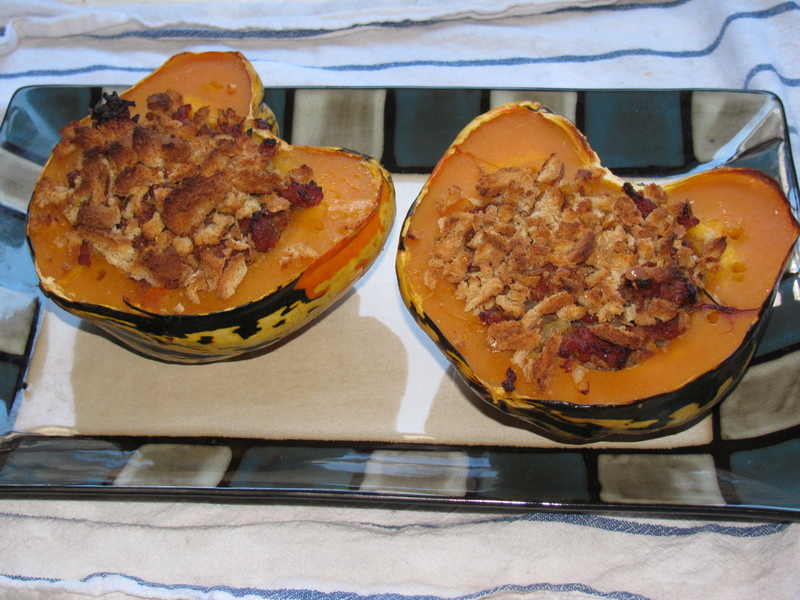 I searched for a recipe and found this one on a great site called The Shiksa in the Kitchen. It is a traditional recipe, and shows some great pictures of the process, including frying them. I thought this might just work. . . . >>> Click here to see the Shiksa in the Kitchen recipe for traditional falafel. But it did not turn out as well as I thought. I ate them anyway, but there just was not enough spice. I wanted the cumin and pepper to stand out a lot more. And it was too mushy on the inside – even after almost an hour of baking. I used my recipe for tzaziki sauce. >>> Click here for an interesting beef recipe and the yogurt-dill-cucumber sauce called tzaziki on the BGE forum. Here are some pictures of this edible but failed attempt. . .
Falafel on the Big Green Egg Oven! Falafel balls – about 2 tablespoons placed on a non-stick pizza pan. Big Green Egg with Platesetter, “legs down,” and Big Green Egg Pizza Stone. About 50 minutes at 350 degrees F. Nice and brown, but still mushy on the inside – too moist. Falafel balls in pita bread, with tzaziki sauce. Just a few seconds ago, I found this oven baked version for falafel on a site called Cookie and Kate: I might try this falafel recipe next time I fire up the BGE.